As far as Greek islands go, Santorini is one of the most famous of the Cycladic islands, with its world renowned blue domes, white washed buildings alongside the caldera, and its stunning views of the Aegean Sea. Here are a selection of 10 of my favourite photos from my trip to Santorini, which I hope will spark your wanderlust to visit this spectacular island. I practically cried when it was time to leave and I know I will definitely return in the near future, as I fell in love with its immense beauty. Oia’s famous Blue Domes with a view of Amoudi Bay in the background, a popular spot filled with traditional Greek taverns. There are so many wonderful shops to see as you stroll through the quaint streets of Oia, and I particularly loved the ones selling wall art. I regret not purchasing one! You can also find a blue domed church in the village of Megalochori, which is such a pretty place to take a stroll, and close to the wineries. The evil eye symbol can be seen all over Santorini, with shops selling it, pictures on walls or ornaments hanging. The Greek evil eye is known as Mati. In Greece, the Mati pendant actually dates all the way back to the 6th Century B.C in ancient times. I bought one for myself! An alternative view of the village if Oia, one of the most famous and most photographed of the Greek islands. Santorini is known for its spectacular sunsets and this one was witnesses from Imerovigli, where we were staying, and it was breath taking. The Akrotiti Lighthouse was built in 1892 and is the country’s oldest lighthouse. It offers amazing views from the area around it. 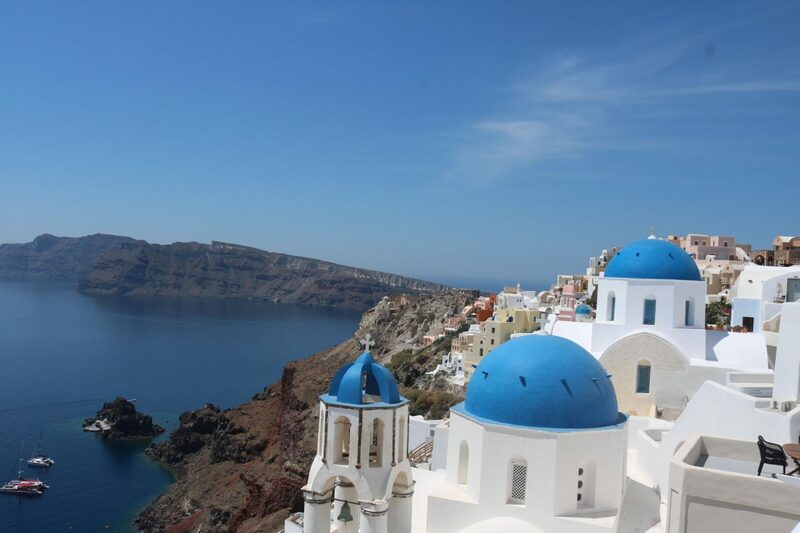 Ammoudi Bay, a picturesque spot, 300 steps from Oia. Wine tasting in Santorini is an amazing especially with the amazing caldera views that you can enjoy whilst sipping on fantastic Greek wine. This was taken at Venetsanos Winery, Megalochori, which is a top recommendation from me. Finally, wherever you are on the island, you are guaranteed incredible views and once you visit Santorini, you are guaranteed to leave a piece of your heart there.